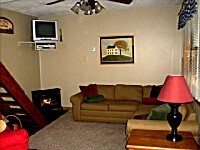 Located in the Hocking Hills on Lake Logan. 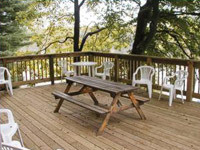 Sleeps 6 is very nicely furnished with large deck area, porch swing, gas grill, fully equipped kitchen, Hot Tub, sitting rooms, 2 private bedrooms, and 2 gas fireplaces. Lake view property located in the Hocking Hills. Sleeps 6-8. 3 bedrooms w/double beds 1 futon, 1 bath, open family room/kitchen, covered front porch, deck, gas grill, outdoor firering, hot tub porch swing. Approx. 30 sec walk to lake.